This text shows, based on the first chapter of the Gospel According to Luke and the lawful worship of the Old Testament, that the Birth of the God-man indeed took place at the end of December, and was not a date set to harmonize with the feast of the sun god or winter solstice, as syncretistic religious scholars and certain Orthodox Christians accept in error. 5. Was Zechariah a Priest or High Priest According to Luke the Evangelist? 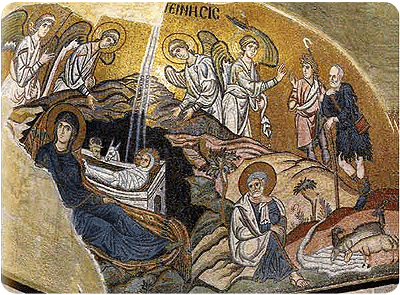 In recent years one hears more and more frequently the view, that because the exact date of the birth of Christ is unknown to us, the Church placed Christmas on the alleged day of the pagan celebration of the "Invincible Sun" (the "god" Sol Invictus), as a symbolic gesture, to mean that Christ is the Sun of Righteousness, and in order to replace the pagan feast by overlapping it. 1) The priestly service of Zechariah, father of John the Forerunner, in the Temple of Jerusalem (built by Herod), during which Zechariah was informed of the conception of the Forerunner; immediately after his service his wife Elizabeth conceived. This point is the key to the whole issue, because the Gospel of Luke tells us that the Annunciation to the Theotokos took place six months after the conception of the Forerunner. 2) The Annunciation to the Theotokos, which initiated the conception of God the Word through the Holy Spirit, took place six months after the conception of John the Forerunner (Lk. 1:26). 3) Nine months later Christ was born according to His human nature, since Christ was perfect man and in all things like us, "except sin". The narration of Luke the Evangelist regarding the announcement to Zechariah in the first chapter of his Gospel (1:1-25) can, according to the holy Chrysostom, give us a determination when that feast took place when the conception of John the Forerunner was announced to Zechariah, and the Angel terminated the barrenness of Elizabeth. He writes: "Once when Zechariah’s division was on duty and he was serving as priest before God, he was chosen by lot, according to the custom of the priesthood, to go into the temple of the Lord and burn incense. And when the time for the burning of incense came, all the assembled worshipers were praying outside. Then an angel of the Lord appeared to him, standing at the right side of the altar of incense" (Lk. 1:8-11). Further on, it is testified that the people outside didn't know what caused the delay of Zechariah in the Temple, while he was speaking with the Archangel Gabriel: "Meanwhile, the people were waiting for Zechariah and wondering why he stayed so long in the temple" (Lk. 1:21). The interpretation of the words of the first chapter of the Gospel According to Luke by Saint John Chrysostom, seems to impinge on hermeneutical difficulties, which Chrysostom resolved successfully, and the rest of his hermeneutic seems to consent. The interpretation of the holy Chrysostom, as developed in his discourse "On the Day of the Birth of our Savior Christ", is based on three important facts: a) on the reports of the altar of incense in the above Gospel text; b) on the non-visual and non-physical proximity of the people with the prolonged interval within the Temple by the priest Zechariah; and c) that Zechariah was alone in the Temple, which is why the people were waiting for him. On this basis the holy Chrysostom suggests that Zechariah entered the Holy of Holies of the lawful Temple. With these preconditions, Chrysostom goes on to interpret what was the liturgical relevance by which the High Priest entered the Holy of Holies, when he writes: "If therefore it is clearly demonstrated from the Scriptures that the High Priest entered the Holy of Holies only once and alone, and when and what month of the year he entered that one time, then the time will be determined as to when the announcement took place. And when this is made clear, we will all know when the conception took place"4 of the Forerunner by his mother Elizabeth. 1. "Η Λογοκλοπή της ημερομηνίας των Χριστουγέννων" ("The Theft of the Date of Christmas"). 2. Second Kathisma of Matins for November 13th, from the Service to Saint John Chrysostom. 3. "On the Day of the Birth of our Savior Christ", PG 49, 356. "Εἰς τήν γενέθλιον ἡμέραν τοῦ Σωτῆρος ἡμῶν Χριστοῦ 4, PG 49, 356· «Πόθεν οὖν εἰσόμεθα, ποῖος ἦν ὁ ἕκτος μήν τῆς κυήσεως τῆς Ἐλισάβετ; Ἄν μάθωμεν ποῖος ἦν ὁ μήν, καθ' ὅν ἤρξατο συλλαμβάνειν. Πόθεν δέ εἰσόμεθα ποῖος ἦν ὁ μήν, καθ' ὅν συνέλαβεν; Ἄν μάθωμεν κατά ποῖον καιρόν εὐηγγελίσθη Ζαχαρίας ὁ ταύτης ἀνήρ." 4. Ibid. "Ἄν τοίνυν ἀποδειχθῇ σαφῶς ἀπό τῶν Γραφῶν, ὅτι καί ἅπαξ εἰσήρχετο εἰς τά Ἅγια τῶν ἁγίων ὁ ἀρχιερεύς, καί μόνος, καί πότε, καί ποίῳ μηνί τοῦ ἐνιαυτοῦ τό ἅπαξ τοῦτο εἰσέρχεται, εὔδηλος ἔσται ὁ καιρός, καθ' ὅν εὐηγγελίσθη· τούτου δέ γενομένου δήλου, καί ἡ ἀρχή τῆς συλλήψεως ἔσται τοῖς πᾶσι γνώριμος."